Today is Christmas Eve and the first day of Hanukkah. Around the country, many people are celebrating with their families and exercising their right to perform their religious ceremonies in comfort and dignity. Meanwhile, I’m learning how to make armbands. You see, I live in Montana. 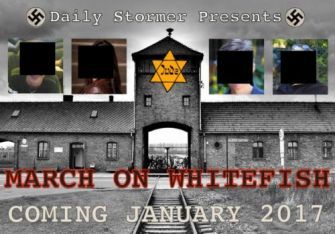 The same Montana where neo-Nazis have vowed to hold an armed march against Jewish people and stores in the town of Whitefish. They will be carrying armed rifles. I will not. Instead, I want to carry a symbol. An idea. A reminder. So tonight I’m learning to make armbands. Black armbands with a gold star in the middle. And I will wear one openly on the day those Nazis march into Whitefish. I will stand in that street and I will remind them– and the world– why this is not okay. I will remind them why our First Amendment proudly declares that we are free to practice any religion we choose– without fear. Without discrimination. Without armbands or Nazis or hatred. I will remind them why our fathers and grandfathers fought and died against the terrors of oppression that carried rifles and wore swastikas. I will not be afraid. This is an open call for aide. I am not asking you to stand with me and my husband in Whitefish when they march next month. But I need help reminding the world why this fight is important. A gold star on a black background. An armband for each person that chooses to face the swastikas and assault rifles. A symbol. A reminder. Help us. Make one, two, a thousand–whatever you can– and send them to those who are willing to stand against an evil that should have been stamped out 70 years ago. Let them hear us. Good people far outnumber evil in the world. We are here. We see and hear you. And we will not stand for this.